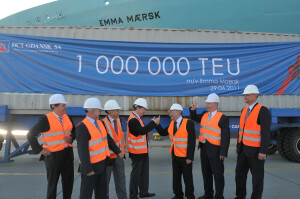 DCT Gdansk, Poland’s leading container terminal handled its millionth TEU on 29th June 2011. This is an important milestone for DCT Gdansk as after just 3 years it is already one of the most important container terminals not only in Poland but in the whole Baltic Sea Region. 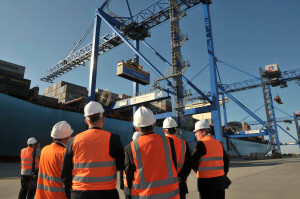 DCT started its rapid growth at the beginning of 2010 when the Maersk Line AE10 service extended its route to Gdansk. This boosted DCT Gdansk’s development as it became a Baltic Sea hub and was further enhanced when Maersk Line decided to upgrade the AE10 string to the biggest container vessels in the world in May 2011. DCT celebrated its 1 000 000 TEU container with special splendor as this container was unloaded from Emma Maersk, the flagship vessel of Maersk Line during its maiden call at DCT Gdansk.